After spending nearly a week wandering around Bangkok, it was time to take a break and head towards the beaches of the south. 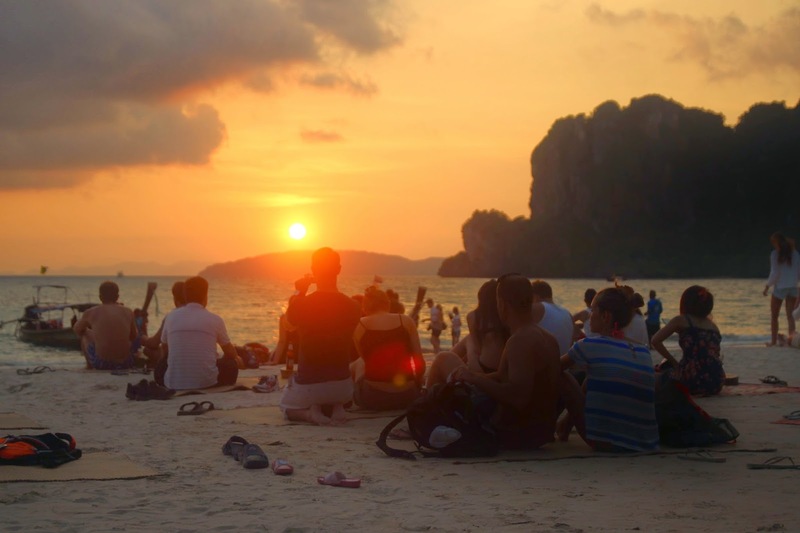 Knowing I had a limited time before I needed to be back in Bangkok to meet my friend Jimmy and travel to Myanmar, I planned on only visiting Railay Beach, somewhere I had stayed nearly seven years prior, and Koh Phi Phi. 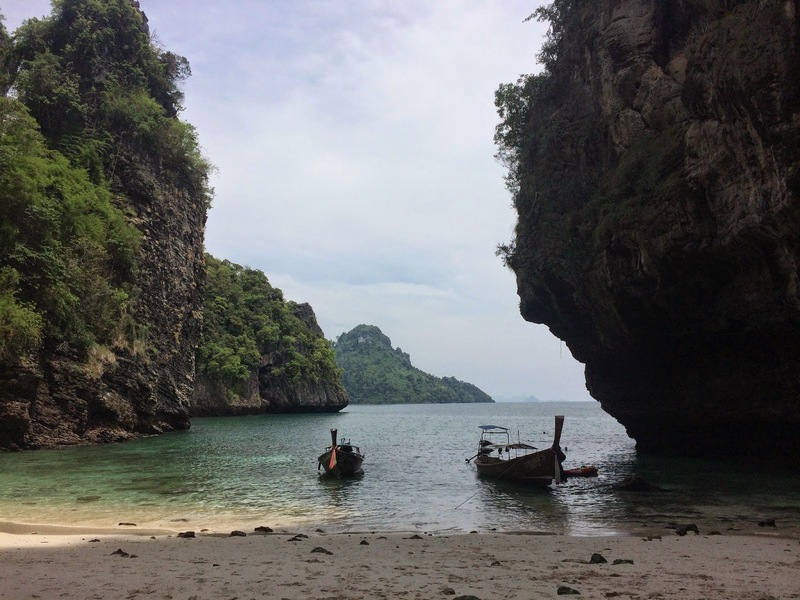 If I had had more time, I probably would have also visited Koh Tao and another island or two, but as it was, traveling on my own, limiting myself to a week and only two major stops was certainly in the best interest of my budget! I booked a train from Bangkok, also reserving the corresponding bus ticket that I would need to get from Surat Thani to Krabi. (Sidenote: when researching train and bus options, I used the site Seat 61, which was immensely helpful). While the berth was nice and wide, and actually long and comfortable enough for me to lie down on, the constant jerking and rocking of the train prevented me from getting any decent amount of sleep. Somehow I also lost the bus ticket, so I was forced to pay for a second ticket to get myself closer to Krabi. The bus situation was also bizarre, as one bus picked up a large group from the train station, took us to another stop where we were divided up by our final destinations, then put into minivans, then taken to another spot, where we waited on more people to join, loaded up onto another bus, and repeated the process, being taken to a third stopping point, where a smaller group of us loaded a final minibus to take us to our final destination. 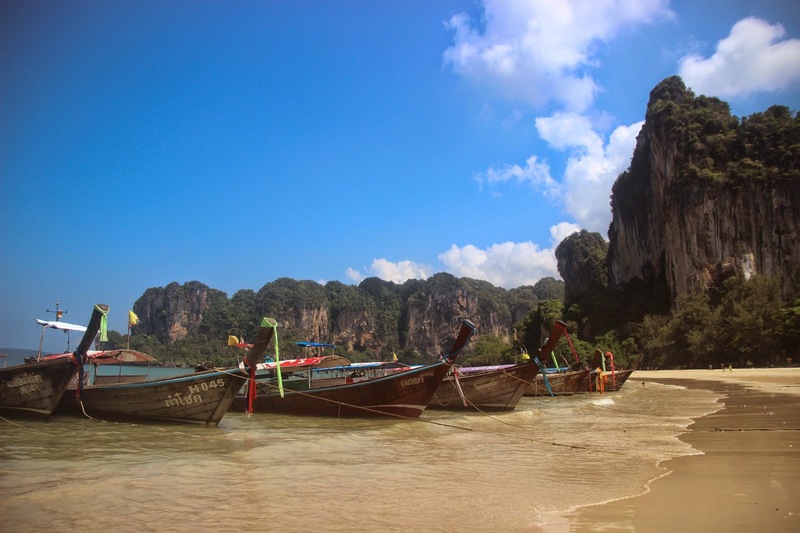 By this time I had updated my ticket from simply Krabi to get all the way to Ao Nang, where I would catch a 45 minute longboat to get to Railay, rather than a much longer ride from Krabi. 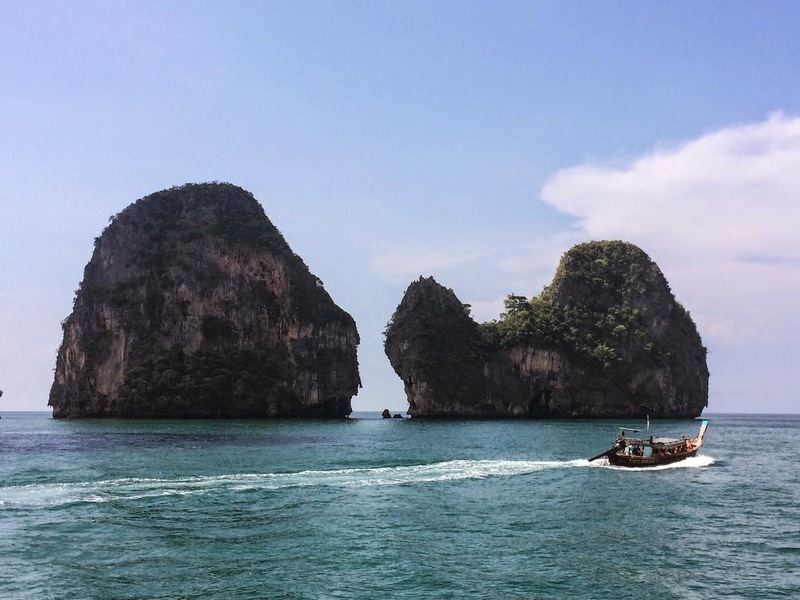 Finally in the longtail, I could take in the blue skies, the turquoise water, the refreshing breeze, and the limestone rock jutting out of the sea. It was absolutely gorgeous. Despite the gorgeous scenery, it was also disgustingly hot, and as I wandered the island with an English couple I had met in transit looking for accommodation (holy crap there are a lot more options than seven years ago!!! ), we became absolutely drenched. We settled on Railay Cabanas, the most basic accommodation we could find - wooden bungalows set far into the middle of the peninsula in between Railay East and West, with no air conditioning, no hot water, no sink, and no real way to prevent insects from getting inside, which still cost ฿350, or about $11. 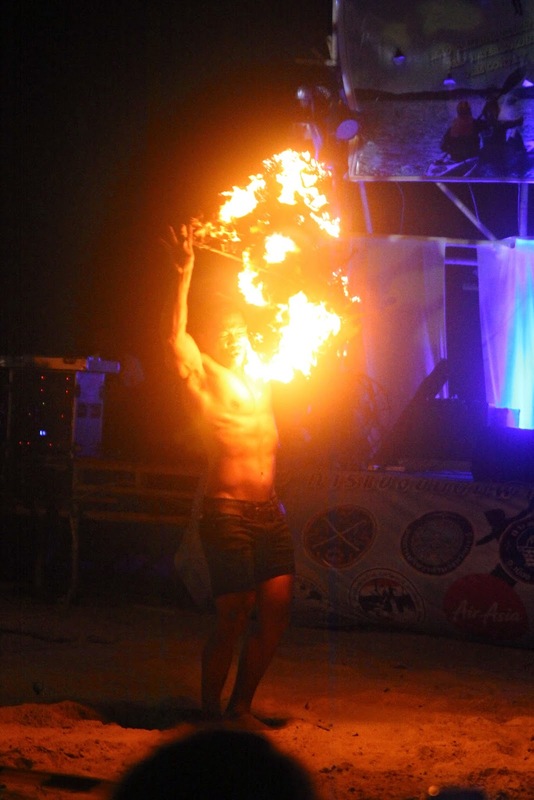 We immediately made our way to the beach, where we enjoyed some delicious food (I had fried rice with chicken, nestled inside a fresh pineapple), and realized that we had arrived in Railay just in time for their "Rock and Fire Contest", a three-day competition consisting of a rock climbing marathon, deep water soloing, and fire dancing. 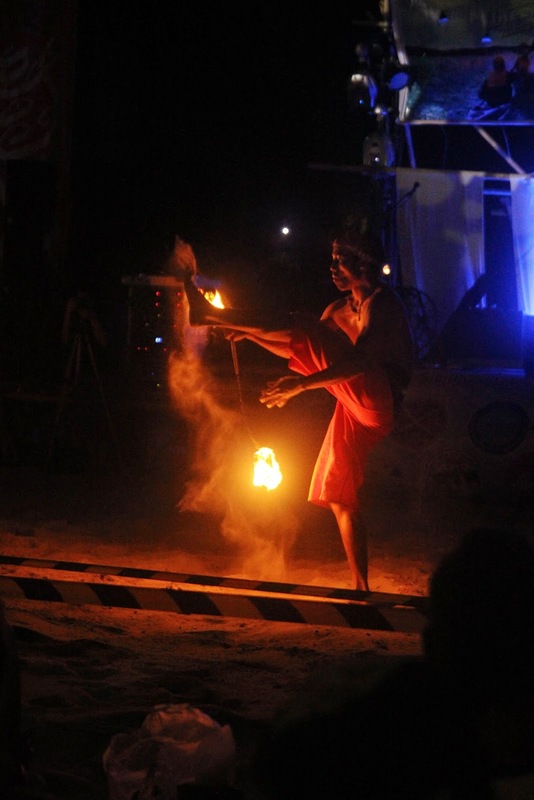 In addition, each night the local restaurants set up small stands along the beach with small plates of food at discounted prices, a great way to get a taste of a variety of incredible dishes. 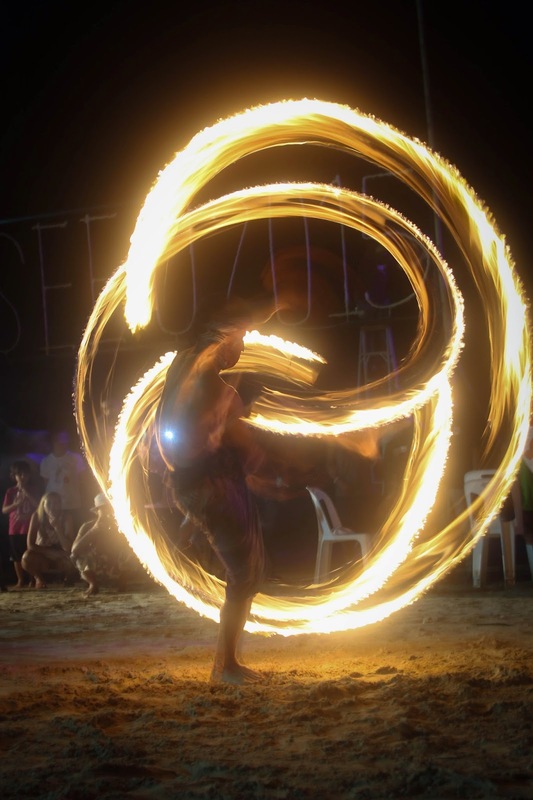 We lucked out and had arrived on the day of the primary fire dancing competition, and we settled in to watch the incredible spectacle. 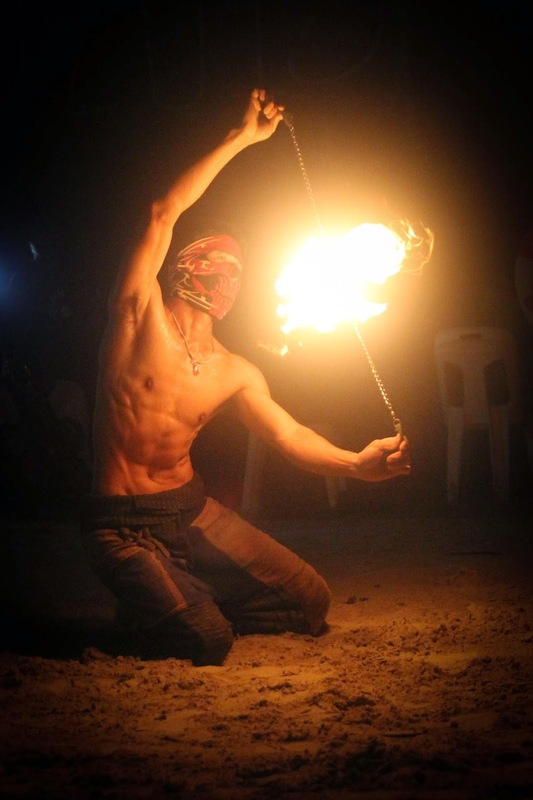 The grace and athleticism of the performers, using large staffs with flames on either end or spinning flames at the ends of a set of chains, was amazing - between the spinning, contorting, dancing, throwing, and catching. 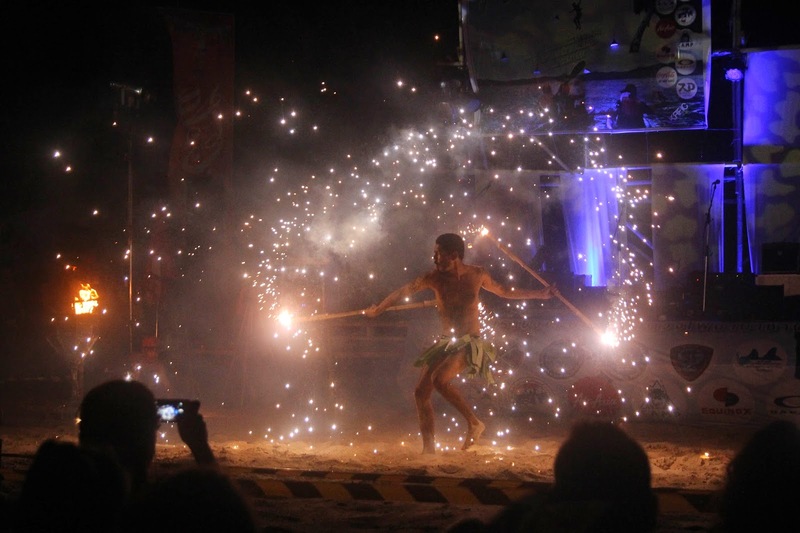 Each performer had their own style - many wore board shorts, some wore jeans, one wore a sort of ninja-looking outfit, and one wore a banana leaf skirt, finishing his performance with a pair of sticks that shot fireworks out of either end, reminding me of the Santa Eulalia Festival way back in Barcelona! After all of the competitors had performed, we were treated to a local reggae band who didn't quite know all the correct words to the songs, but had great energy nonetheless. 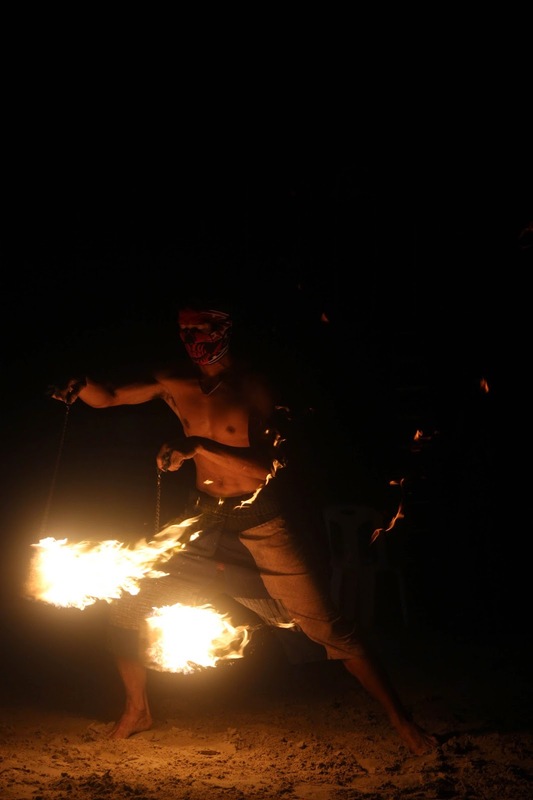 As we made our way back to our bungalows, we ran across a firedancing instructor, who guided us along the dark path with actual torches. The following day, I headed straight for the beach, relaxing, reading, and swimming in the rejuvenating ocean all morning. 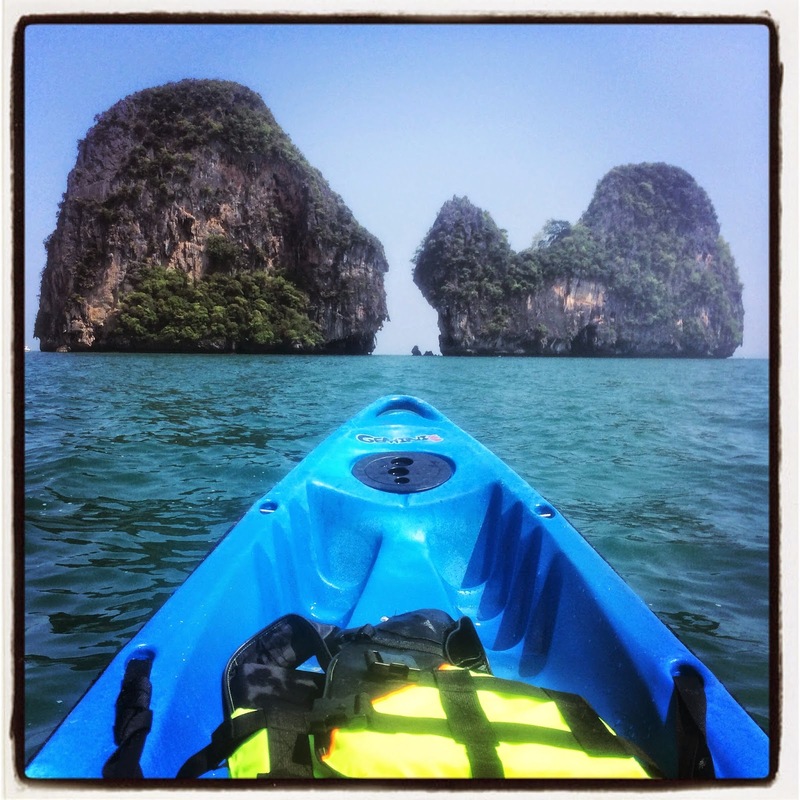 After a quick lunch, I decided to rent a kayak for an hour or two, and I paddled over in the direction of Ao Phra Nang, passing alongside the incredible rock, through small passages, and to two massive rock outcrops near the beach. Realizing that this venture had taken hardly any time, I spotted what seemed like a not-so-distant island with a little beach and some longtails, so I decided to challenge myself by paying it a visit. It took a solid hour to make it to Poda Island, crashing over small waves, determined to finally make it to the beach. And when I finally did reach that tiny bit of paradise….. a ranger greeted me. Asking for money. Apparently it was a national park, and a visit would cost me ฿200, about $6, for a half day. Exhausted, there was no way I was going to turn right back around, so I begrudgingly paid the fee, found a beach chair, and decided to make the most of my time there. I set up in the soft white sand, in view of a large limestone rock covered in trees jutting out of the ocean, enjoying my book for an hour or so. I decided to head back out on the kayak before there was any risk of impending darkness, but the way back was much more challenging! The water had gotten much more choppy as a storm started moving in, and though I was mostly going with the current, the waves kept passing under me, giving me the feeling of running in place. I finally reached the shore, exhausted and sunburnt, not long before a stunningly beautiful sunset filled the sky. The distant rumble I had heard on my way back became an ever quickening darkening of the sky, so I quickly grabbed a plate of pad thai from one of the beach vendors and ducked into Railay Coffee, a tiny spot with actual walls and a door (and air conditioning! ), just as the bottom dropped out of the sky. 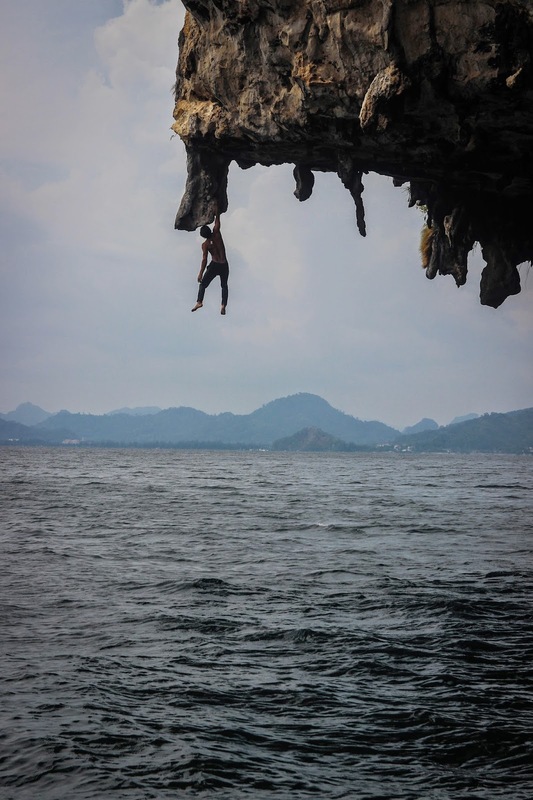 Huddled into the tiny cafe with two Asian men and a group of Americans, I made friends with the English speakers, and wound up making plans to meet some of the guys to try out deep water soloing the next day. Once the rain cleared, we ventured back out to the beach to find that the celebration had hardly missed a beat. We settled in to watch an encore performance from the top two fire dancers from the previous night's competition, heading back towards our respective rooms once the reggae band came back on the stage. I met Ajay and Jesse at Basecamp Tonsai the next morning, where we picked out sopping wet climbing shoes, picking through the pile to find some without holes in the toes! We then loaded up a longboat and headed out to our climbing destination, which would be just on the other side of Poda Island from where I had kayaked the previous day. I had pictured a specific type of boulder problem - start climbing just out of the water, probably on a gradual decline to an overhang, and when it was time to drop off the route, I would just leg my feet dangle over the water and let go of the overhang, dropping down. It wasn't at all like what I pictured. I arrived to find ladders that needed to be climbed just to make it to the start of the routes. And from there, they were more like typical sport routes than boulder problems. To finish up, you would get to a certain point, usually much higher than where you had started, turn around, and leap off into the water. Nooooooo no no no no no. So despite the rock being absolutely incredible, I didn't make it much further than the top of the ladder. 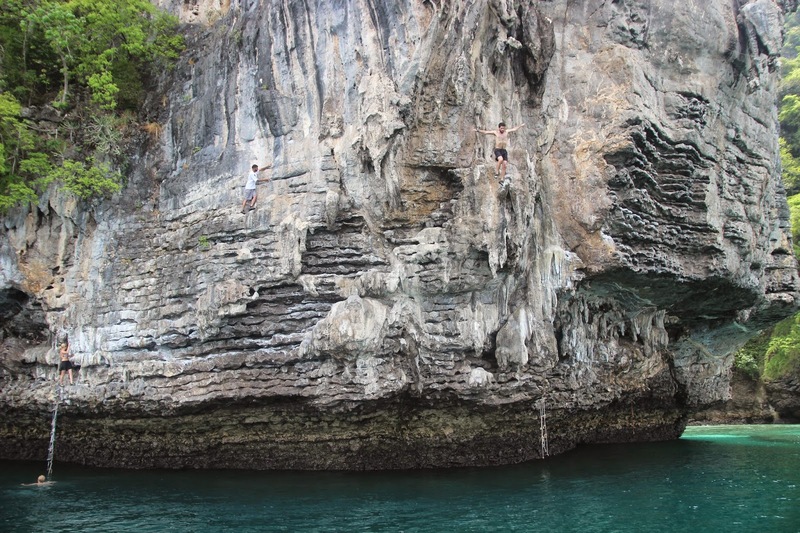 I just couldn't bring myself to climb up knowing I would have to cliff jump, something I absolutely hate. So instead, I mostly sat on the boat, chatting and taking photos of the other climbers. We took a break for lunch on a tiny secluded beach, where a few of us tossed a disc around - somehow I had found ultimate players in my group - and had a chance to do a bit of snorkeling. The spot we moved to for the afternoon climbing session was even more terrifying looking - a rock that was even higher, more jutted out, and I wanted nothing to do with it, though the lines did look incredible. 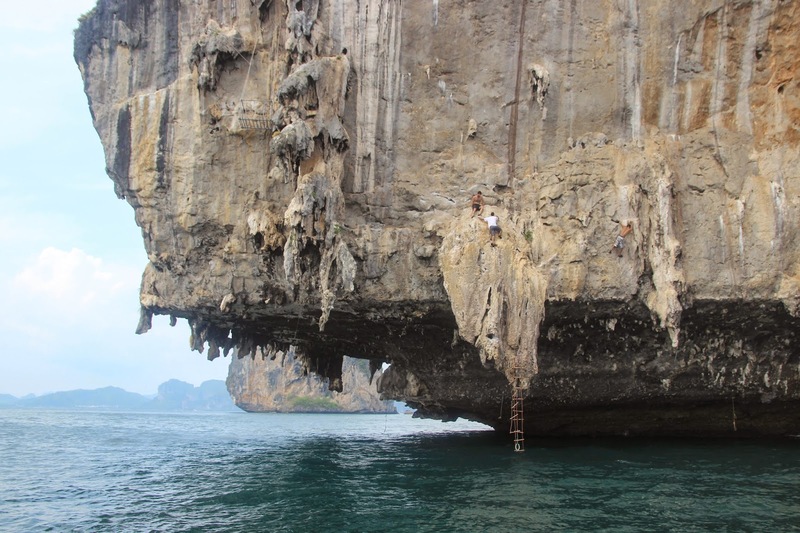 I stayed on the boat, as many of the other members of the groups tried the various routes, culminating with our guide climbing one of the longer, more difficult routes on his own. With no shoes on. 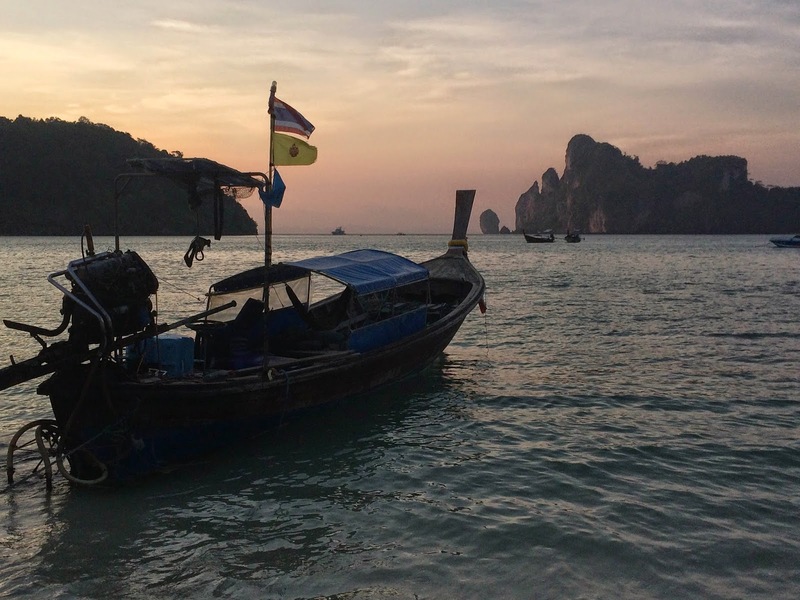 Back on Railay West, I watched the sunset and bumped into the entire American group from the previous night, joining them for an incredible family-style meal of fresh sea bass and barracuda and traditional side dishes. 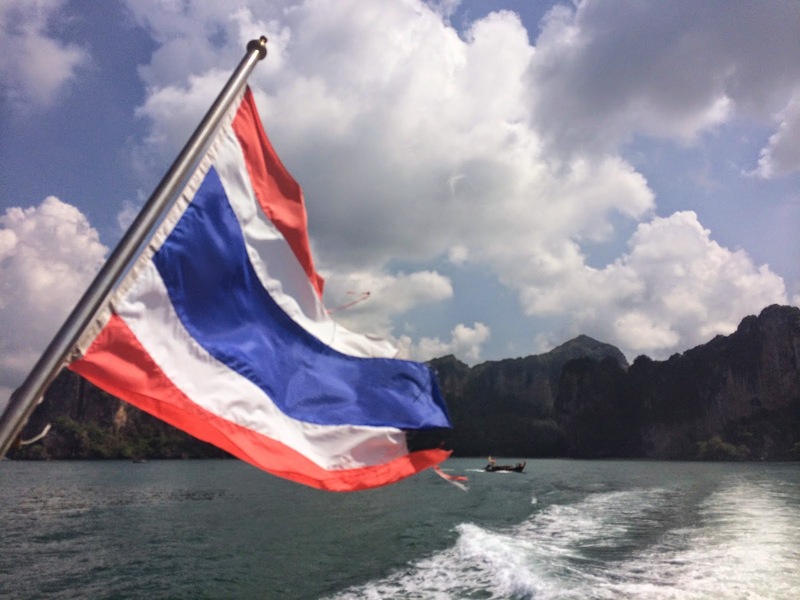 Early the next morning, I boarded a ferry to Koh Phi Phi, a relatively short trip that provided beautiful views of the turquoise water and limestone cliffs. 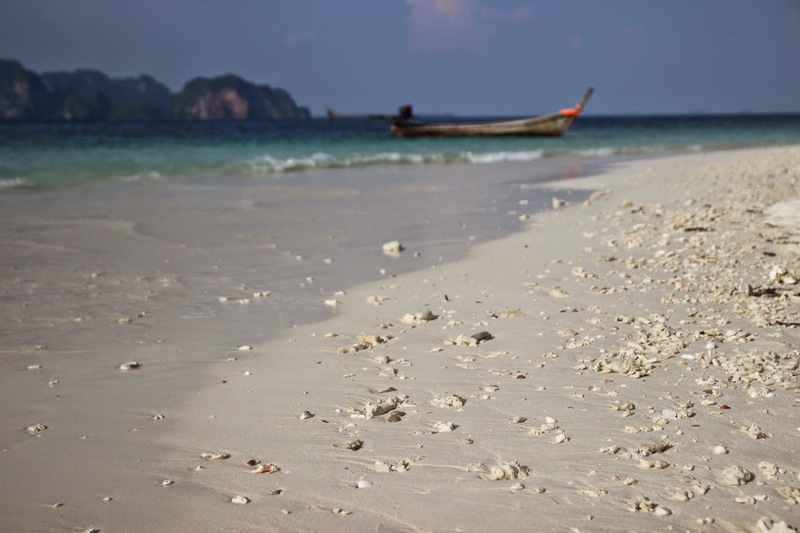 Once I arrived at the pier, I made a beeline to a spot my friends Aidan and Caleb (whom I had met back in Kathmandu, Nepal) had mentioned called the Sea Shell Hut, as we had just discovered that we would be spending a night on the island at the same time! The tiny guest house resembled a beach house from Seaside, Florida, complete with pastels and seashells hanging everywhere. Somehow the guys arrived mere minutes after I did, and once we had all settled in, we set out to find lunch. We stopped in a spot called something like 'pirates cove', in full view of the constant stream of tourists making their way through the busy main street. After delicious plates of pad thai and green curry, we hopped on a longtail boat for a quick ride to Long Beach, on the same island. Long Beach was quiet and secluded, perfect for laying out and reading, taking refreshing dips in the clear water, and enjoying the relaxing atmosphere. We spent a few hours just hanging out, wrapping up our beach time with tasty cold fruity and coffee beverages at a beachside cafe. Back in the center of town, after a bit more rest and getting cleaned up, we ventured out for some fast food burgers at a streetside stand, got some Thai massages (and a pedicure for myself), then headed towards the bars, looking in cheap t-shirt shops on the way. As we ducked inside one shop, it started absolutely downpouring, complete with crashes of lightning and booming thunder, with no sign of letting up anytime soon. So instead of making it all the way to the beach bars, we ran across the road to a small Irish bar called 'Paddy's Place', where we ordered happy hour specials and made music requests until the rain eventually let up. 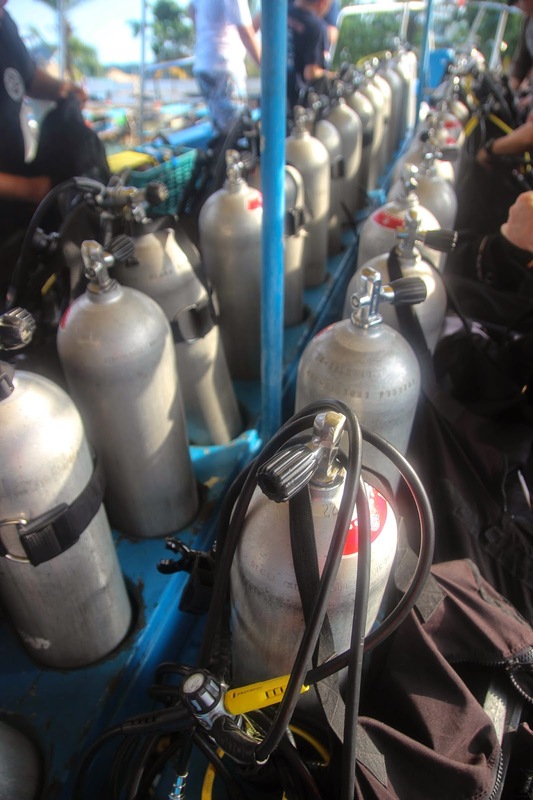 I turned in early, as I had an early morning of diving planned for the following day. I grabbed some delicious fresh banana bread around the corner from the guesthouse and arrived at the Barakuda dive shop by 7:40. Incidentally, my dive instructor's name was JJ, and it promised to be a great day of diving. 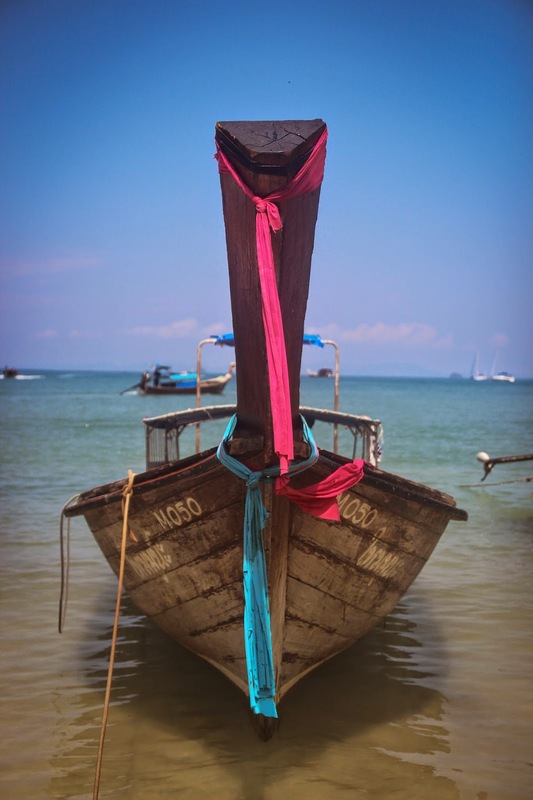 We loaded up the boat and took a relatively short ride out to our first destination: Koh Bida Nok. We suited and geared up, hopped off the boat, and took the plunge. 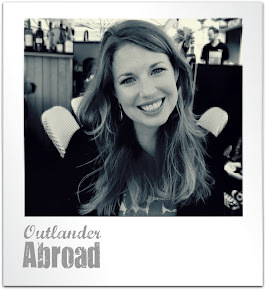 I was paired up with a guy from NYC, and along with a pair of German girls, we were guided around the depths by JJ. Despite some relatively low visibility, it was absolutely gorgeous under the waves, as dozens of parrot fish floated by, dressed in their day glow colors as if they were ready for the full moon party. A variety of corals sprouted up around us, cones and brain shapes and bright vibrant blue blobs with tendrils waving out of the tops. We saw scorpion fish in their ugly grumpiness and schools of tiny silver fish moving as if they were a single unit. 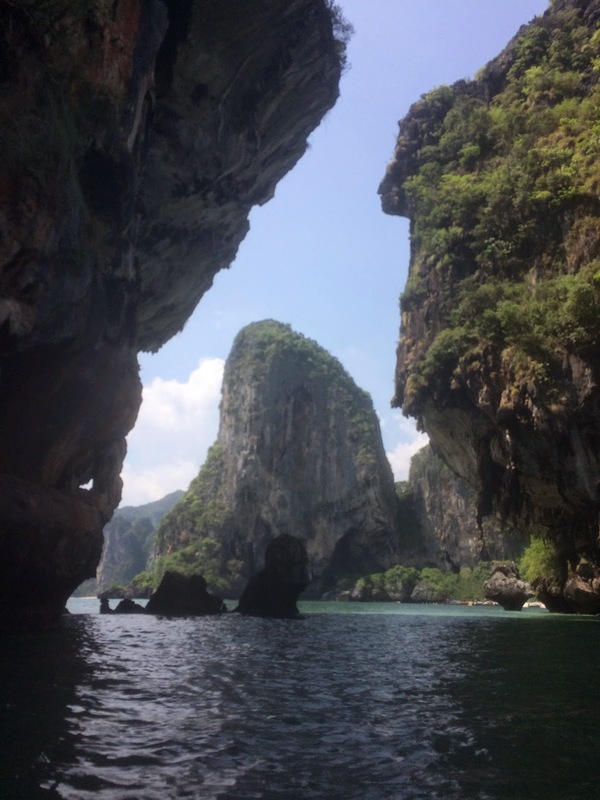 We surfaced and returned to the boat, taking a quick break for lunch - containers of rice with chicken and sauce to pour over the top - as we anchored in Maya Bay, site of the filming of the movie 'The Beach' which has turned Maya Beach into a massive tourist destination. As a result, the beach was jam-packed full of speedboats and people, enough that it was difficult to see the actual sand underfoot from our vantage point out in the bay. 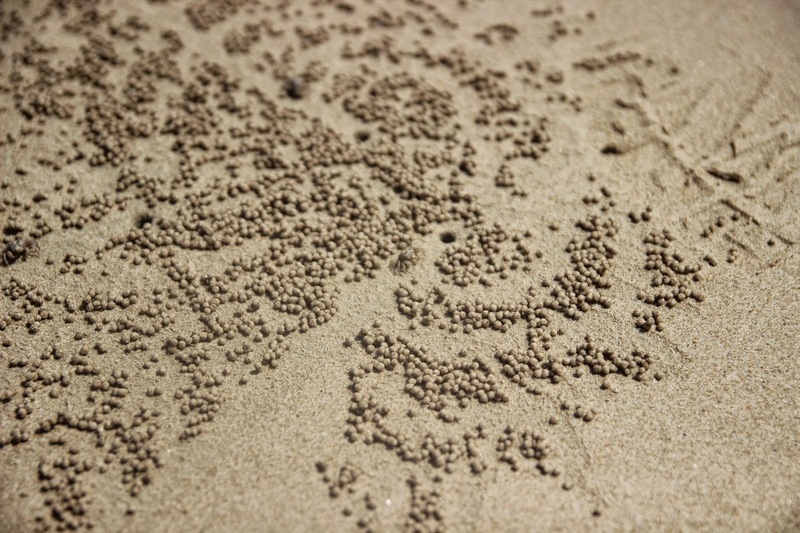 It made me want to avoid a visit to the beach rather than the alternative!! Our second dive began with an almost immediate spotting of a black-tipped reef shark, albeit a small one that zipped away quite quickly! 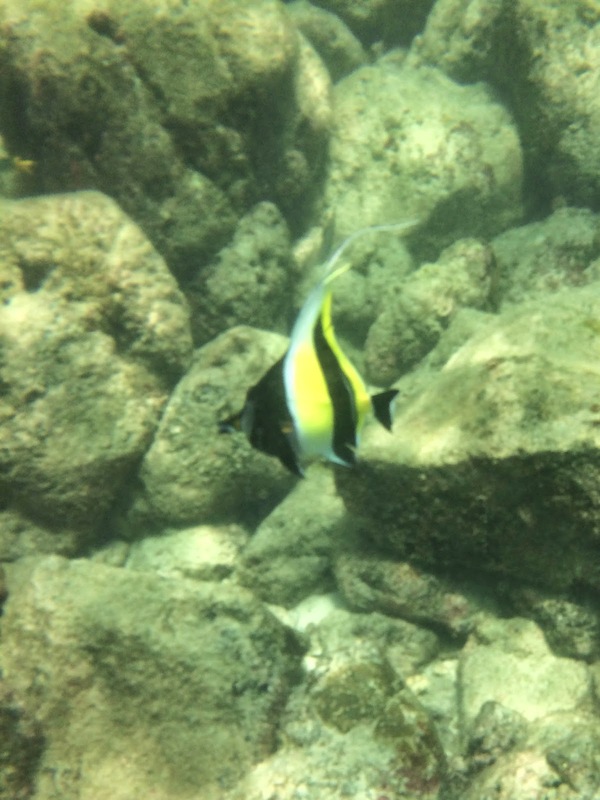 We also spotted a small stingray gliding through the water and clown fish playing amongst the anemone. On this dive the ocean floor was covered with a rust-colored plant that resembled stiff lillypads, carpeting the ocean floor. Both dives were peaceful, beautiful, and as always, lent the feeling of soaring through an entirely different world. 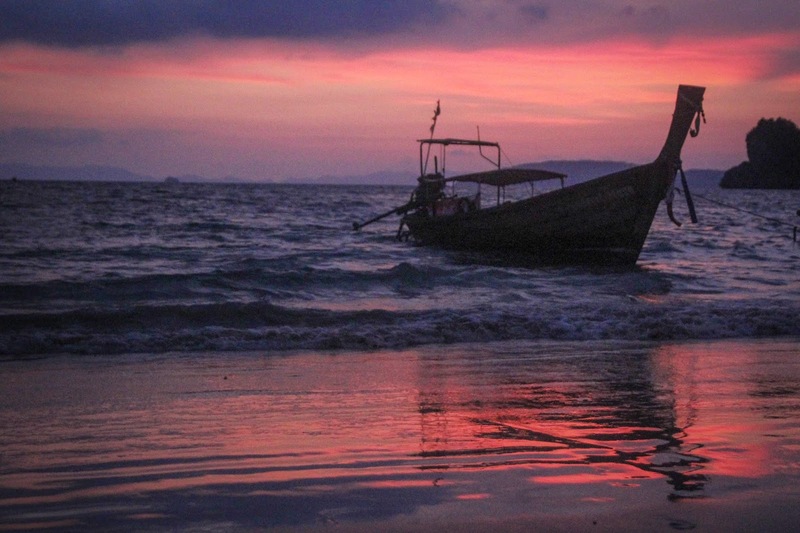 Back on dry land, I had a very low key afternoon and evening, writing postcards at a nearby bakery, taking in the sunset at a quiet beach, and bumping into the English couple I had met on Railay, joining them for a lovely meal. I finished up the night with a fantastic foot massage from a spot the divemasters had recommended, then had another early night, in preparation for another morning of diving and a departure from Phi Phi. My final morning on the islands, I somehow managed to get completely packed up, checked out, and have breakfast in hand and in the dive shop by 7:40 again. Instead of diving with JJ again, I was paired up with a girl from the Czech Republic, and she and I would be led by a divemaster named Simon. 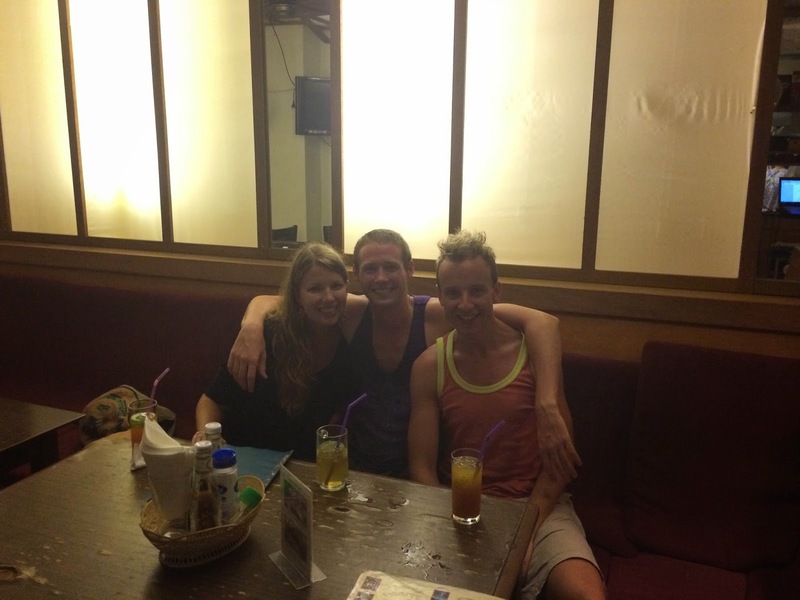 While he was a wonderful divemaster, he was newer to Phi Phi and unfortunately didn't know the reefs quite as well as JJ had in terms of knowing where to spot the various sealife! 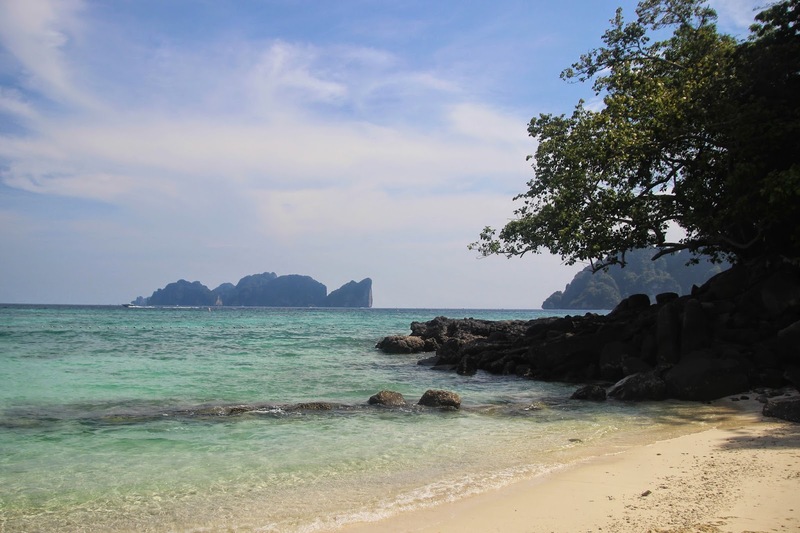 We again started off at Koh Bida Nok, on the opposite side from the previous day. We saw more lion and scorpion fish, colorful little sea slugs, and a moray eel, well out of his hiding spot. Just after the eel, we also spotted a little banded sea snake before surfacing. 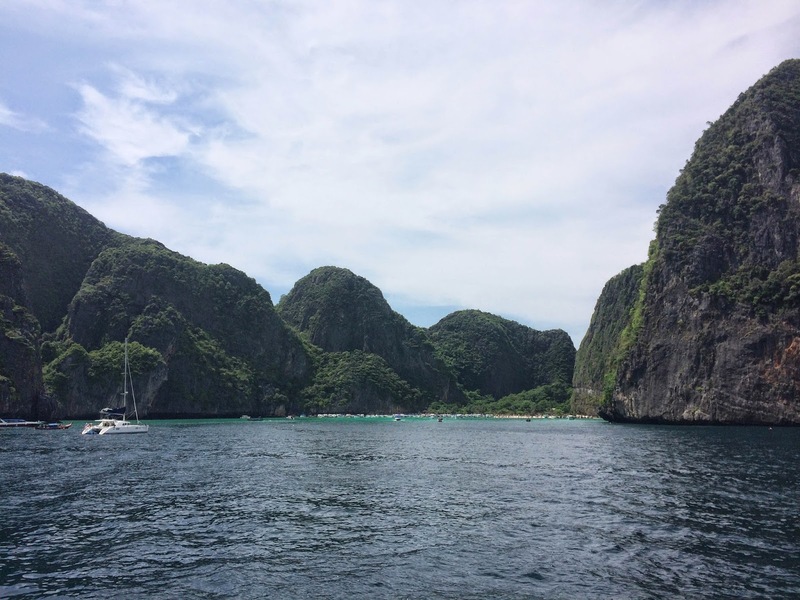 We had lunch in Maya Bay again, not sticking around long, so we could head out to our second dive spot. This time JJ and his discover scuba trainee were just in front of us, and JJ had spotted a tiny sea horse! It was so cute, hiding under a bunch of coral, and we took turns getting an up-close glimpse at the little creature. We again saw plenty of other sea life, and I actually spotted quite a few scorpion fish and another moray eel entirely on my own. Unfortunately the rest of the groups spotted a sea turtle, which we somehow never found! Back at the dive shop I quickly logged my dives and took a shower in their upstairs bathroom, then headed straight to the pier to catch a ferry to Phuket! The ferry was uneventful, and once we arrived I headed straight to the bus station, not wanting to deal with the train this time around. Thankfully, despite waiting an hour for a taxi and then spending almost as much time in that taxi driving around town, there were still a couple of bus options for me, a VIP leaving at 6:30 and a regular bus at 7:20. I decided to save a few bucks and go with the regular (definitely should have gone VIP, though the regular was fine enough), finding a little cafe just outside the bus station where I could have a snack and connect to wifi before boarding. While a step down from the South American buses, I still preferred the bus to my train experience, and I even got a bit of sleep despite two stops occurring at roughly midnight and 3 am. We pulled into the Bangkok bus station early in the morning, wrapping up my adventure down south to the beautiful beaches of Thailand. Next up: Exploring Myanmar (Burma), a fascinating country with a complex history.